What is Year Round Pell? The Department of Education has announced that students that are eligible for Pell Grant may be able to receive a third disbursement of Pell Grant. Fort Valley State University will implement “ Year Round Pell Grant” beginning in the summer of 2019. The general rules are that students must be eligible for Pell Grant as determined by the Department of Education, and must be enrolled at least half-time for the summer semester. Half-time enrollment is six (6) credit hours for undergraduate students. Graduate students are not eligible for Pell Grant. View this short video for more information on Year Round Pell Grant. Does this mean I get more Pell? It is important to note that this change will not result in extra Pell Grant being awarded to a student over the course of their undergraduate enrollment. The maximum timeframe Pell LEU that eligible students may receive Pell Grant is for the equivalent of twelve full-time semesters or 600%. In the past, a full-time student could receive only two disbursements equaling 100% per academic year. Now the student will be able to receive up to three disbursements equaling 150% per academic year. Many students use all of their annual federal loan eligibility in the fall and spring semesters, leaving no additional loan funds for the summer semester. If possible, students are encouraged to reserve some of their annual federal loan eligibility to use during the summer semester. Students that have been awarded Pell Grant for the 2017-2018 academic year are encouraged to contact the Office of Financial Aid for assistance with financial planning for the summer 2018 and for the 2018-2019 academic year. Here is an example of how Year-Round Pell Grant will work for the 2017-2018 academic year. A student with a zero EFC (Expected Family Contribution) is eligible for $5,920 in Pell Grant for the year (100%), or $2,960 (50%) for the fall semester and $2,960 (50%) for spring semester (based on full-time (12 credit hours) enrollment both semesters). Under the old rules, that student would not receive any Pell Grant if they enrolled for the summer semester. Under the new Year-Round Pell Grant initiative, the student would receive an additional $2,960 (50%) disbursement if they were to enroll full-time for summer. If the student enrolled half-time, the student would receive $1,480 (25%) of Pell Grant for summer or one-half of the full disbursement. Students can use financial aid with remaining funds. Click here for more information. Scholarships are “free money” generally awarded based on merit or need and are not paid back. Additionally, any scholarship that you receive may reduce or replace the self-help (loan or work-study) portion of your aid package. You must notify the Office of Financial Aid of any scholarships you receive that are not already listed on your financial aid award offer. Low-interest student and parent loans are borrowed money that must be repaid. Loans are a large part of many students’ aid package. Borrow only what you need. Always remember that you will pay back what you borrow. Fort Valley State University participates in the Federal Direct Student Loan Program to offer Stafford loans and Parent Loans for Undergraduate Students (PLUS). A limited amount of funds is available through the Perkins Loan Program for students with exceptional need. Additional information is located under the Loan Applications Link. Student Expense Budgets for 2014-2015. The Higher Education Act of 1965 as amended (HEA) suspends aid eligibility for students who have been convicted under federal or state law of the sale or possession of drugs, if the offense occurred during a period of enrollment for which the student was receiving federal student aid (grants, loans, and/or work-study). 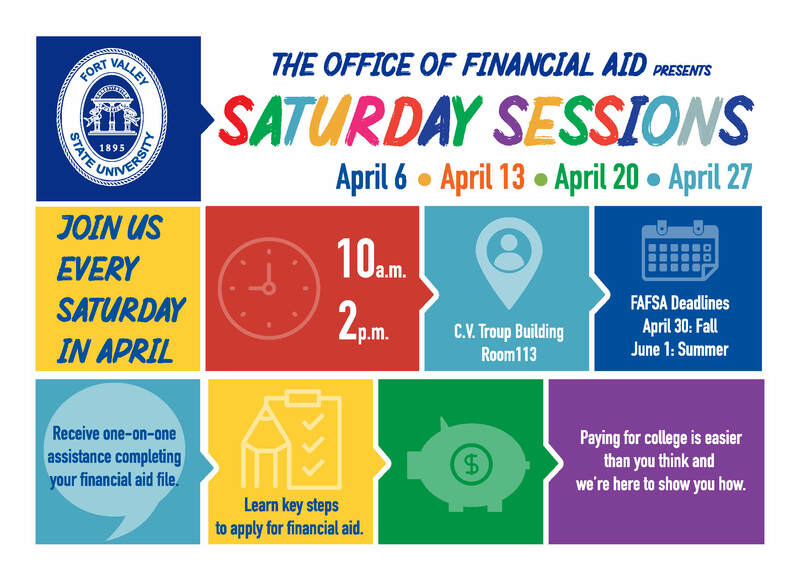 If you have a conviction(s) for these offenses, call the Federal Student Aid Information Center at 1-800-4-FED-AID (1-800-433-3243) or go to the FAFSA on the Web site, click on “Before Beginning A FAFSA” in the left column, then click on “Drug Worksheet” to find out how this law applies to you. The payment of FVSU financial aid will be disbursed to the student upon the completion of the courses. Provide the proof of payment toward courses from the host institution with proof of completed course work. Pell recipients must be enrolled for a minimum of 6 undergraduate semester hours. Your Pell Grant award in BANNER is calculated at full-time enrollment (12 hrs). Your Pell Grant will be prorated according to the hours of enrollment. Student’s that are awarded loan funds must be enrolled for a minimum of 6 undergraduate semester hours. Students must pay any fees that they incur at the Host Institution by the fee payment deadline for the Host Institution. FVSU will not send your financial aid to your Host Institution to pay your tuition and fees. This form is for FVSU students wishing to be transient to another University System of Georgia institution. If you are a transient student to FVSU, please contact your home institution and request a HOPE transient certificate be sent to FVSU. Due to HOPE Scholarship regulations, all GPA’s must be reviewed at the end of the semester that you attempt 30, 60 or 90 hours, and also at the end of each spring. If requesting for summer HOPE transient status, once spring grades are posted and you meet the 3.0 or higher GPA requirement, we will forward the HOPE Transient Certificate to the “host” institution indicating that you are HOPE eligible. Because the fees at the “host” institution may be due before grades are available, you may need to plan to pay your fees up front and be reimbursed by the “host” institution. At the end of the semester, you will need to make arrangements with the “host” institution to have your transcript(s) sent back to the FVSU Office of the Registrar. If you fail to meet the GPA requirement of a 3.0 at one of the checkpoints, you can regain the HOPE Scholarship at the next checkpoint (30, 60 or 90 hours attempted hours) as long as your GPA is 3.0 or higher. For a complete review of the HOPE Scholarship Regulations, visit the Georgia Student Finance Commission’s web site GAcollege411.org. If you have not already done so, contact the FVSU Office of the Registrar at (478) 825-6282, and request the Transient Permission Form. This form is required by the FVSU Office of the Registrar and is necessary to make sure your classes attempted at your “host” institution will be transferred and/or accepted back to FVSU.